It was a whirlwind year for dinosaur palaeontology, yet again. This week I’m writing about what I consider the most important news in my science field for 2014, for the Science Borealis blog carnival. There are so many great stories to choose from! Kulindadromeus and feather-like structures in ornithischians? The bizarro new reconstruction of a short-legged Spinosaurus? Both of those stories were pretty interesting, but my choice has to be the description of multiple skeletons of the Mongolian ornithomimosaur Deinocheirus. If you like dinosaurs, there’s a good chance you’ve heard about Deinocheirus before, even if it’s not quite a household name like Stegosaurus or Triceratops. Deinocheirus (which means “Terrible Hands”) was found during the Polish-Mongolian expeditions in the 1960s, and up until very recently has only been known by this single specimen, a pair of tremendous arms. And I do mean tremendous! 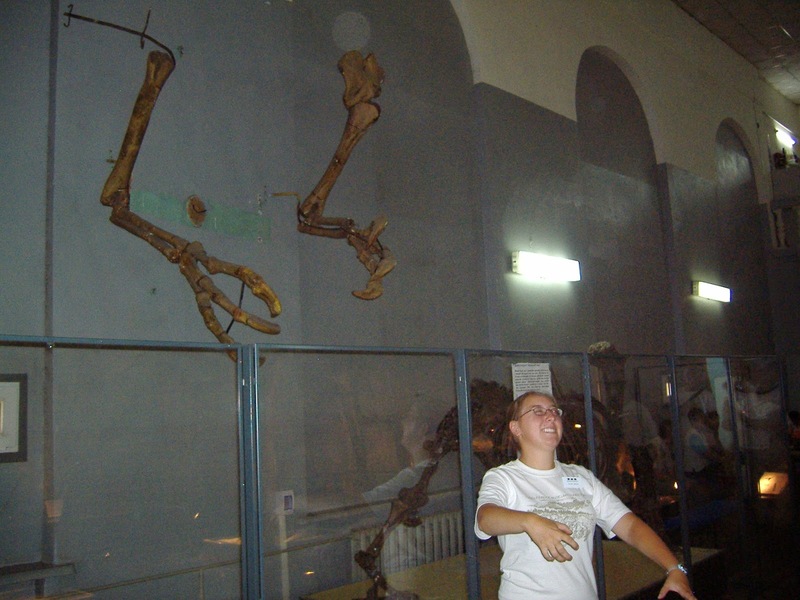 Me, in 2007, mimicking the ‘zombie arms’ of Deinocheirus, rather convincingly if I do say so myself. A few years ago, the quarry for this holotype specimen was relocated and some gastralia (belly ribs) were found and described, but besides that this has been it. What on earth did the rest of this dinosaur look like? Was it a carnivore, herbivore, or something else? Where did it fit in the Cretaceous Gobi ecosystem? While the exact evolutionary relationships of Deinocheirus have been enigmatic, there’s been a general consensus that it was some kind of ornithomimosaur, or ostrich-mimic dinosaur. Even if you’re not a dino-buff, you’ll recognize ornithomimids as the stampeding dinosaurs in Jurassic Park – Gallimimus was the one ‘flocking this way’, and, conveniently, Gallimimus is a commonly encountered fossil in the Upper Cretaceous rocks of the Gobi Desert and would have lived alongside Deinocheirus. Where Gallimimus is an elegant, sprightly kind of dinosaur, Deinocheirus, it turns out, is not at all, not even a little bit. It turns out that Deinocheirus is even more surprising than we would have ever guessed; the giant arms are nothing compared to the weirdness of the rest of its skeleton. Deinocheirus looks like a cross between a therizinosaur and a hadrosaur. It’s a big, broad-bellied ornithomimosaur with a ‘sail’ of heightened neural spines on its vertebrae, and a widened, shovel-like snout with a deep jaw and tiny eyes. It looks like it was adapted for eating vegetation and had gastroliths preserved in its stomach region, but also had fish scales in there as well, prompting the authors to describe it as a megaomnivore, which is among my new favourite words of the year. 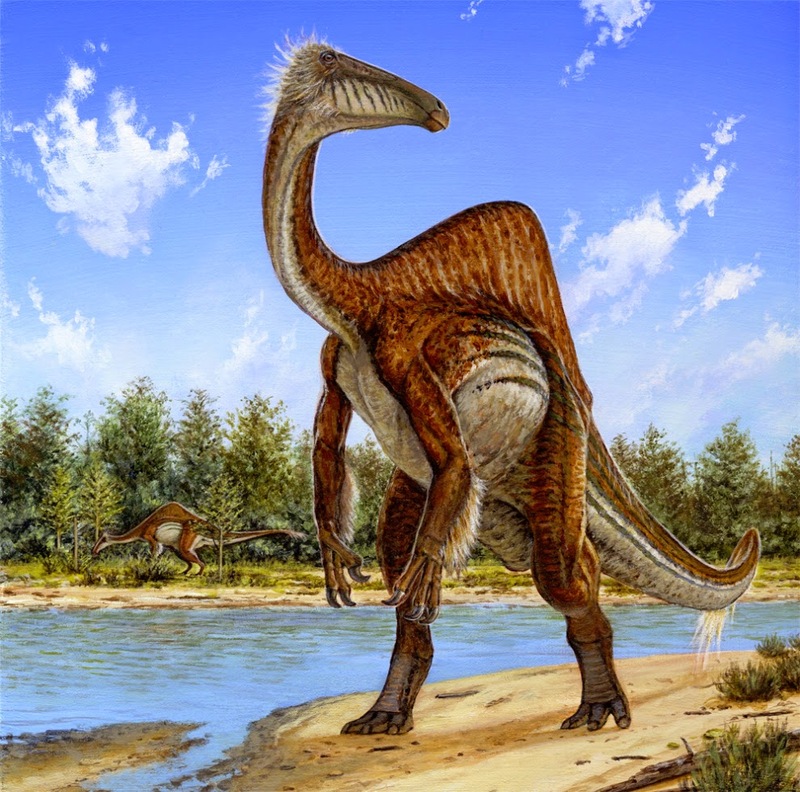 Given that its close relatives the ornithomimids are known to have had feathers, as well as many other theropod dinosaurs, it is most likely that Deinocheirus had at least some feathers. Deinocheirus, by the always-incredible Michael Skrepnick. I will forever be jealous of my colleague Derek Larson, who was on the 2009 Korea-Mongolia International Dinosaur Project expedition that found the new skeletons of Deinocheirus (I was there just a year later, and it was a great year…but no Deinocheirus). I’m so thrilled that I’ve been able to see the original bones in person, and they really are quite something to see – I hope that the specimen will eventually be mounted and put on display so everyone can see it for themselves, too! 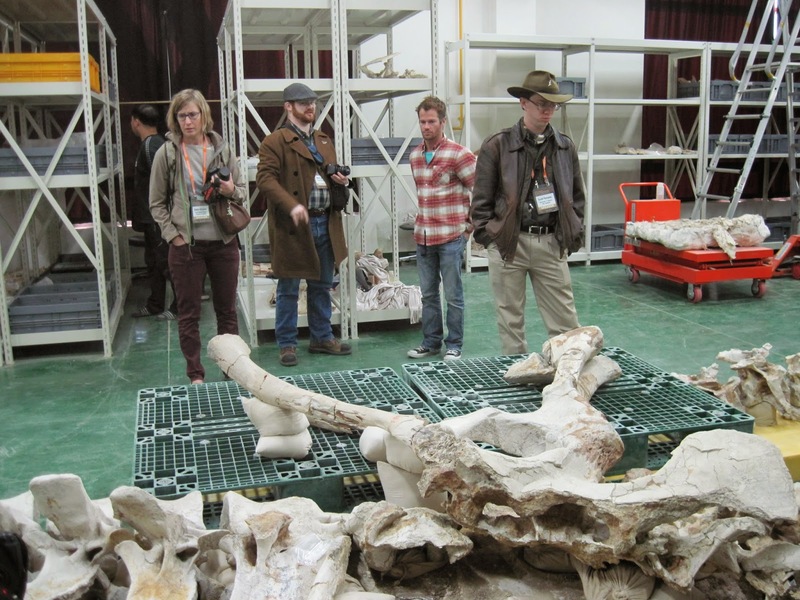 The “Canadian contingent” (which actually includes at least one American and one Australian, but let’s not be too picky) at the 2013 Hwaseong International Dinosaurs Expedition Symposium last December, gawking away at Deinocheirus. Deinocheirus is also an important reminder that Mongolian fossils are under threat. Sadly, many probably excellent skeletons are removed illegally from Mongolia every year – no fossils are allowed to leave the country without a permit, and none can be sold, so any fossils from “Central Asia” on the auction blocks are almost certainly stolen goods. The Deinocheirus skull had made its way out of Mongolia some years ago, and was, thankfully, repatriated to Mongolia when word of the new skeletons began to circulate throughout the palaeontological community. Incredibly, the skull actually belonged to one of the newly collected skeletons! This is a story that could have ended very differently – we might not have known about the strange skull of Deinocheirus because of fossil poaching. Poached fossils make everybody sad! Here Phil Currie is showing the remains of a tyrannosaur skull that was improperly collected by poachers and destroyed in the process. So why choose Deinocheirus over Kulindadromeus or Spinosaurus? Like I said, all three are top contenders for the most surprising finds of 2014. In some ways, the fuzz of Kulindadromeus is less surprising, and its significance lies in the fact that it lends support to the hypothesis that fuzz was present in most dinosaurian clades. Spinosaurus has also long been considered a specialist in aquatic foods, so while the new skeletal revision is certainly weird, it’s not quite a fundamental re-envisioning of this beast. But Deinocheirus is way beyond what anyone would have ever predicted the rest of the skeleton would have looked like, and just goes to show that there are surprises waiting around every corner for us when it comes to dinosaur diversity. And, in my opinion, Deinocheirus leads to even more questions than it answered: what was it doing with that sail; why is its jaw so deep and its eyes so small; what kind of environment produces a megaomnivore like that; are any of the bits and pieces of what we thought was Gallimimus actually parts of juvenile Deinocheirus? I could go on and on. Congratulations to my colleagues in Korea and Mongolia for organizing the Korea-Mongolia International Dinosaur Project expeditions – I’m sure this is just the first of many wonderful projects that will result from those years of fieldwork. ← Know Your Ankylosaurs: Mongolia Edition! Nemegt supported three high feeders. Another oddity: If D. mirificus (like hadrosaurs) preferred riparian habitat, why isn't it more abundantly preserved? Why did it take so long to find relatively complete material? I agree about Deinocheirus being the best dinosaur find of the year. Lets face it. The Spinosaurus paper was essentially an extended abstract disguised as a paper and essentially told us to trust them rather than providing data like most science papers. Even though the scaling controversy is probably over there are still some problems with the reconstruction (unikely sail shape, tucked-in gastralia,etc.). Now Deinocheirus is simply a fascinating animal. I now have a new favorite Ornithomimosaur (sorry Struthiomimus). It certainly is not another generic Ornithomimosaur. The most mysterious dinosaur of the 20th century is now a dinosaur who's appearance and lifestyle are well understood. No ambiguities like Spinosaurus and Kulindadromeus (people are STILL guessing about the nature of those two dinosaurs) It's clear that the best paleontological discovery of the year is Deinocherius. Congrats Lee et al.! Dammit can't edit my comment. I was gonna add that Ibrahim et al's COG estimate is probably wrong for various reasons. I guess I should make this clear: I think that both Kulindadromeus and Spinosaurus are pretty big stories and are definitely extremely interesting papers to read, whether or not you agree with all aspects of them. My criterion for decided which was the 'best' dinosaur story is [aside from my own papers, 😉 ] what was most surprising and unexpected, and I think Deinocheirus fits that bill best.